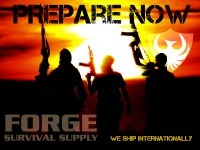 A proper sight picture has a clearly defined front sight post, fuzzy target and rear sights. A big question is always, what is the sight picture for my Pistol's zero? Is the point of impact going to be "under the dot?" 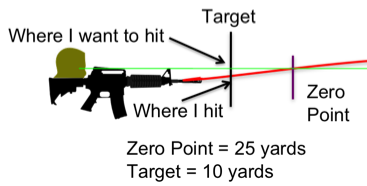 Through conversations with representatives of firearms manufacturers we've determined that, unless otherwise specified, consider the pistol's zero to be at the top of the sight post at 7 yards. As you become more experienced with your chosen pistol, you will learn where to "hold" the sight picture for your desired impact. For less precise target needs the dot reference system may be used for a faster sight picture. We suggest learning to fire with both eyes open. By learning the proper sight picture and getting the reward of a tight shot group at the point of aim we condition the shooter to subconsciously seek the proper sight alignment and sight picture every time they present the weapon to target. Here comes the fun part. Novice shooters, or shooters new to firing with both eyes open, will report seeing either two sets of sights and one target or one set of sights and two targets. This is the curse of stereoscopic vision. 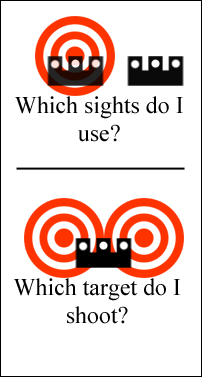 You may have a question like, “which sights do I use,” or “which target do I shoot?” Not really a simple question. First establish which eye is dominant. Then have the shooter close or squint the non-dominant eye to simplify the signals going to the brain. As the shooter learns to concentrate on the proper sight picture this problem will fade. To have a proper sight picture with the rifle, you must learn how to apply "holds." A hold is a deliberate adjustment of the point of aim, to compensate for the bullet's trajectory, in order to strike the target in the desired spot. In order to keep things simple and not get into the merits of a given weapon or ammunition we will only talk about the major influences of Mechanical Offset and Zero distance. Mechanical Offset (MO) is the difference between the sighting system and the center line of the barrel. The MO is the reason that the bullet has a trajectory. 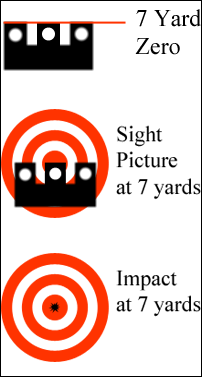 When a weapon is zeroed, the sights are adjusted, creating an angular difference between the line of sight and the line of bore. The graphic below is a greatly exaggerated example of this. The point at which the trajectory crosses the line of sight is a zero point. The closer the target is when you zero the weapon, the greater the arc. The further away the zero point, the flatter the arc. For a comparison of zero distances go to the zero page. When you are shooting on a target inside your zero distance, your hits will be lower than your point of aim. To compensate, you must adjust the point of aim/sight picture to hit where you want. This sight picture adjustment will vary between different sights, mounting options, and zero distance. Here is an example of a shooter firing at about 10 yards with a 25 yard zero. The point of aim is center mass, but the bullets are striking low. Here the point of aim/sight picture has been adjusted by "holding high" for the center mass hit. Again, your hold will vary. It will also change at different ranges. Bottom line, take time to learn how you need to adjust your sight picture and practice, practice, practice.